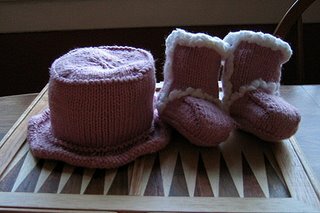 After completely spacing before a coworker's baby shower, I did a quick search online and whipped up some pics of the DIY Ugg Baby Booties and LTK Bucket Hat with the promise that I would knit them for his soon-to-be baby girl (who is now six weeks old). Fast forward two months later (what can I say, sometimes I tend to procrastinate), and here they are! I meant to post when I started (like I keep meaning to do with the honeymoon cami...), but they went so fast, I finished before I could! I didn't bother swatching, since they're baby booties - doesn't matter what size they are, she'll fit in them at some point (and promptly grow out of them in five minutes)! I subbed the yarn because a) the recommended Berroco Suede and Plush are handwash (and new parents have aaall the time in the world for that, right? ), b) I had plenty of KnitPicks Shine left over from the bucket hat, and c) pink uggs are just too future-Carrie-Bradshaw chic. Since Shine does shrink, I went about a 1/4" higher than the pattern called for, ran them through the w/d, then stitched the Heaven over the side/instep and popped them back in the dryer for about 10 minutes to fluff it up. I also added some "X" stitches on the back for some added detail. 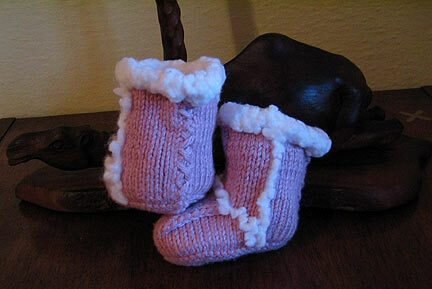 I just love how these turned out - so much so, I may need to adjust the pattern up and knit a pair for myself! Lesson learned: Novelty yarn is not my thing. As for the hat, I did use Shine again for this pattern, mainly because the brim on the baby size is so small, the drapey floppiness wasn't really an issue. I *almost* got away with knitting the entire thing sans a single weave-in, but the skein had a horrible fray about a third of the way in (grrrr), so I had to cut and join. Lesson learned: Baby gifts are so much fun to knit! just when i thought my baby fever had subsided and i didn't want any more children, i see these baby uggs and hat and suddenly i hear the tick tock tick tock of my biological clock. those are ADORABLE! and i love your shrug, too! How precious those are! Love to see a picture of the baby wearing them!